The Trump administration has gone to work to ensure that a rainbow flag dedication at the Stonewall National Monument scheduled for today would not be such a proud moment after all. For the first time, a pride flag was set to fly on federal land, at the site of one of the key battles against discrimination and for LGBTQ equality. The National Park Service had approved and sponsored the event, before abruptly pulling out. It also, under the direction of Secretary Ryan Zinke’s Department of the Interior, worked to certify that the flagpole adjacent to Christopher Park was not technically on U.S. government land, Gay City News reports. “This is emblematic of what’s happening in the country right now to LGBTQ Americans citizens,” said Ken Kidd, one of the event’s organizers. The Trump administration has stood against the LGBTQ community in a number of key ways since assuming power, including pulling transgender student protections, asserting that civil rights laws do not apply to gay or transgender people, and giving people the right to discriminate as long as they cite their religious beliefs as the motivation. The Park Service website no longer shows the page that had the map for the Stonewall National Monument. 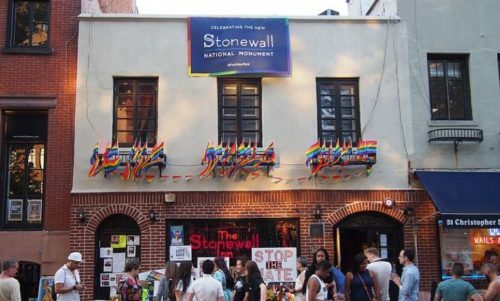 There is also concern that the Trump administration could pull the national monument designation from Stonewall, as it is currently reviewing designations made by the Obama administration.